Start/Finish : Coming from Svolvær, take E 10 to Kleppstad. Just before the big bridge that crosses Gimsøystraumen, take the little road to the right toward Sydalen. Drive to the end of the road. When you enter the hamlet of Brenna, the road turns into a dirt track. Follow it to the last group of buildings and park so as not to be in the way of the farmers. The trail starts after a fence to the right at the end of the track and goes down to the sea. Anyone can walk this hike along the coast in a part of the big island of Austvågøya that is still largely unknown. You leave from the hamlet of Brenna and walk along the northern coast of the island on a good path that serves a few isolated houses facing the Norwegian Sea. The path ends in the tiny hamlet of Nedreneset, at the entrance to the Indrefjorden. The trail starts after the fence at the northernmost part of the hamlet and goes toward the coast. 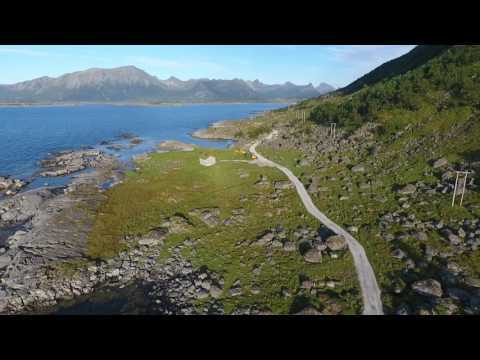 You quickly reach a little lighthouse (to your left) and keep going to the cape of Festvåg. You’ll see several farmhouses along the trail, now converted to summer homes. The trail follows the coast, sometimes through the underbrush, sometimes through little pastures until the hamlet of Nedreneset. It is possible to continue to the end of the valley on a trail that goes along the right bank of the Indrefjorden, but in summer, high grass hides the ground, which is often wet.